This still from a NASA video shows the positions of Venus on the face of the sun at various stages during the transit of Venus on June 5, 2012, as well as on June 4, 2004. Skywatchers have the opportunity to witness history today (June 5), as the planet Venus rambles across the face of the sun in a rare event that will not be visible again for 105 years. Astronomers call this orbital encounter the "transit of Venus," when the planet passes between Earth and the sun, appearing as a tiny black blemish as it travels across the solar disk. Transits of Venus are some of the rarest skywatching sights because they happen so infrequently. Transits occur in pairs eight years apart, once every 100 years or so. 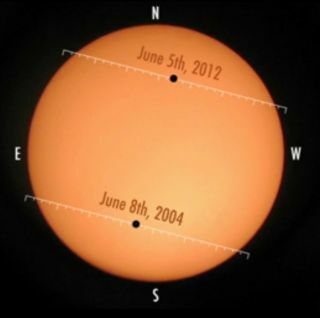 Today's transit is paired with a previous one that occurred on June 8, 2004. Before that, the last pair of Venus transits wowed astronomers and explorers in 1881 and 1889. Anyone who misses today's event, however, will be out of luck, because the next two transits of Venus will not occur again until the year 2117 and 2125. The transit will begin around 6 p.m. EDT (3 p.m. PDT; 2200 GMT) this evening, and will last approximately seven hours. Since the transit of Venus is happening across the International Date Line, it will occur on Wednesday (June 6) in Asia, Australia, Africa and Europe. In North America, the best time to see the transit will be in the hours before sunset today. People located in the mid-Pacific region, where the sun will be high overhead during the transit, will be able to witness the majority of the event. In Europe, Africa and Australia, Venus will be crossing the face of the sun as it rises in the morning on June 6. Skywatchers in Asia and across the Pacific Ocean should be able to view the transit any time on Wednesday, weather permitting. WARNING: It is very important to exercise caution and protect your eyes during the transit of Venus. It is very dangerous to stare directly at the sun. Special eclipse glasses or solar filters for telescopes are needed to avoid permanently damaging your eyes. Have fun but be careful! The safest and simplest technique is to view the transit indirectly using a solar projection. Skywatchers can use telescopes or one side of a pair of binoculars to project a magnified image of the sun's disk onto a shaded white piece of cardboard. This projected image is safe to look at and photograph, but it's important to remember to cover the telescope's finder scope and the other half of the binoculars to avoid accidentally looking through them. It will take about 18 minutes for Venus to fully trek onto the face of the sun, proceeding on a diagonal track across our nearest star. Astronomers refer to the different phases of the transit of Venus as "contacts." When the planet first touches the outer edge of the sun, this is known as first contact. Second contact occurs when Venus appears to be completely on the sun. Third contact refers to when Venus touches the sun's inner edge, and fourth contact follows when the planet is totally separate from the sun. For skywatchers in the eastern parts of the U.S. and Canada, first contact should occur around 6:03 p.m. EDT (3:03 p.m. PDT; 2203 GMT). Observers on Earth are not the only ones who will be jockeying for views of the transit of Venus. NASA astronaut Don Pettit, who is currently partway through a months-long stint aboard the International Space Station, is planning to become the first person to photograph the transit of Venus from space. Pettit will be snapping pictures of the celestial event from the space station's seven-windowed Cupola observation room. NASA's Solar Dynamics Observatory will also be used to stare at the transit from space. The sun-watching satellite will use its observations to calibrate its instruments, as well as help researchers gain more insight into Venus' hellishly hot atmosphere. The European Space Agency's Venus Express and Proba-2 spacecraft will also be monitoring Venus and the sun during the transit. The Hubble Space Telescope plans to use the moon as a giant mirror to measure the light that passes through the atmosphere of Venus and is reflected onto the moon during the transit.For those who are unable to witness the transit of Venus in person, NASA and several observatories will be broadcasting live footage online from telescopes around the world. Members of the public can tune into the webcasts to see real-time views of the transit, coupled with commentary from astronomers and transit experts. SPACE.com will has collected several Venus transit webcasts as part of our complete coverage, in addition to reporters scattered at various transit events in different cities. Assistant managing editor Clara Moskowitz will be attending a special event hosted by the Amateur Astronomers Association of New York at the High Line park on Manhattan's West Side. Staff writer Denise Chow will be stationed at an event at the American Museum of Natural History, where astronomer Steve Beyer will provide commentary during live views of the transit from the Mauna Kea Observatory in Hawaii. Senior writer Mike Wall will be covering the transit of Venus from NASA's Ames Research Center in Moffett Field, Calif.
Editor's note: If you snap photos of the 2012 transit of Venus across the sun and would like to share them with SPACE.com, send images and comments to managing editor Tariq Malik at: tmalik@space.com.